The Villa Park Women’s League is a motivated, talented group of women. 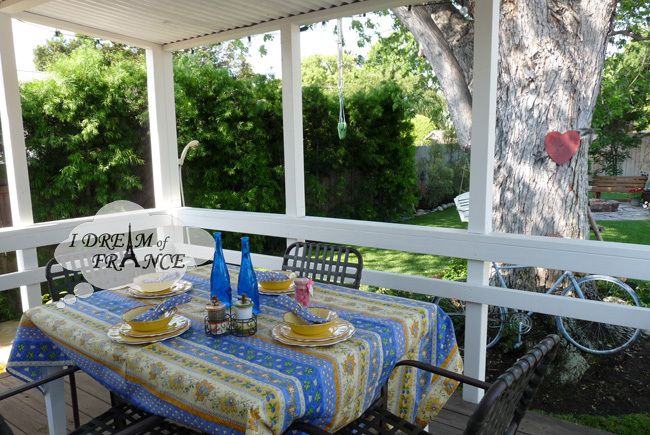 They crossed every T, dotted every i, and left no stone unturned organizing their Home Tour. As a result, the event went off without a hitch. It was a gorgeous group of homes with a huge turnout of attendees. 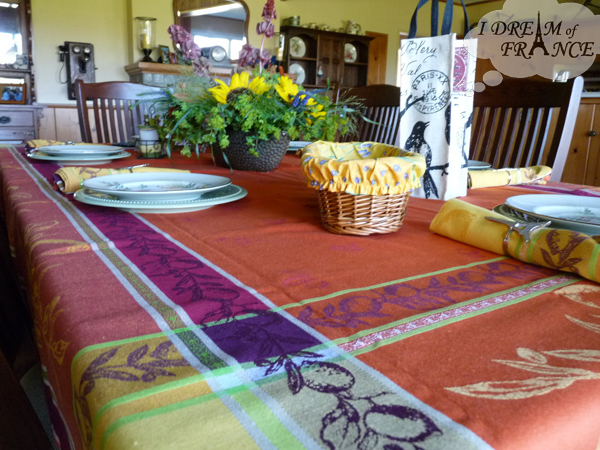 I decorated three tables at an historic home on a large lot with a mature citrus grove. 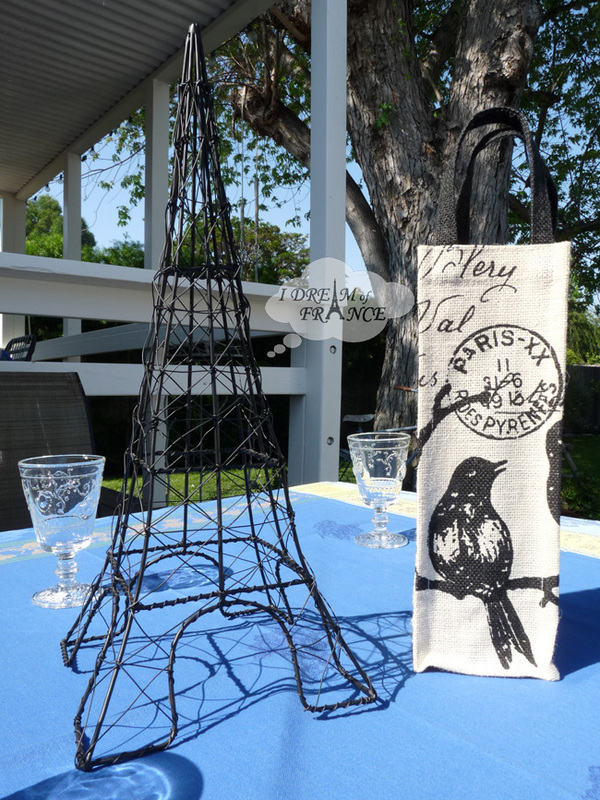 Le Cluny Lemon Rust jacquard tablecloth and napkins, Le Cluny bread basket, Eiffel Tower napkin rings, and wine bottle jute tote bag in the dining room surrounded by antique furniture and a stone fireplace. 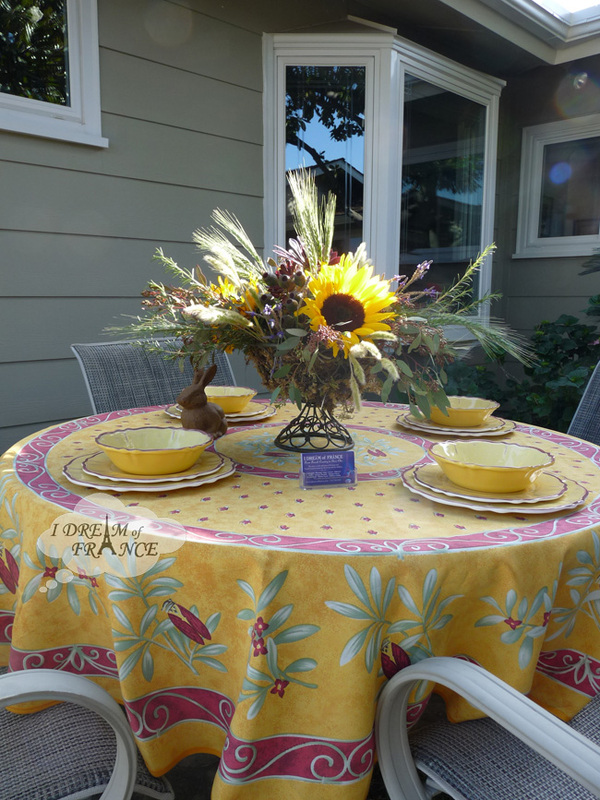 Le Cadeaux Rustica Yellow melamine plates and bowls, cast iron bunny statue, and sunflower bouquet on a patio table in the courtyard. 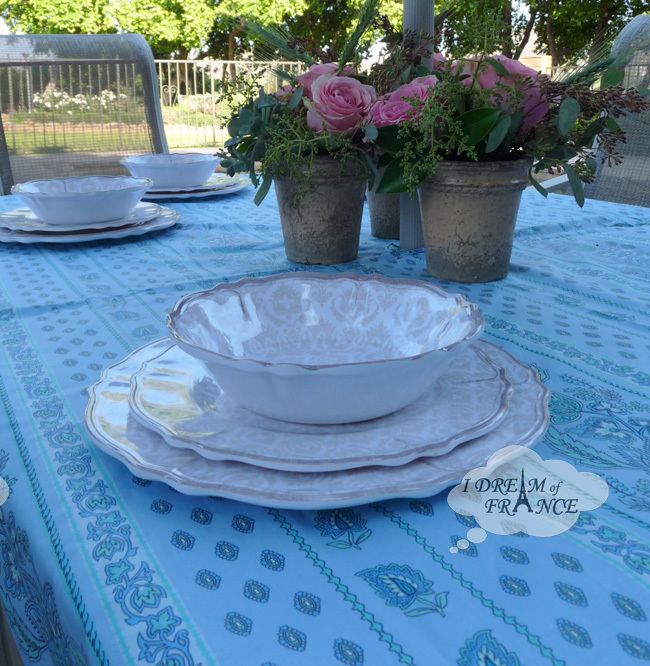 Le Cadeaux Louis White melamine plates and bowls and pink roses by the pool. 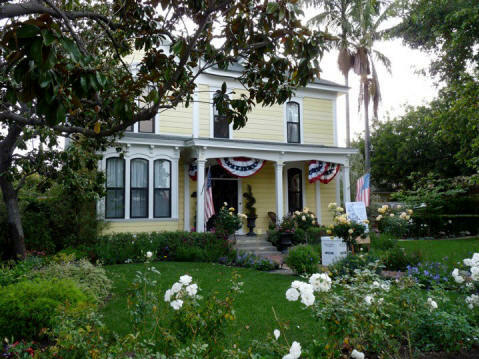 Every spring, we look forward to the local home and garden tours in Orange County, California, because we get the opportunity to create tablescapes for some of the homes. This year was no exception. I had the pleasure of making a tablescape at a residence in the North Tustin Hills for the Tustin Garden Club Tour. The night before this tour, we had a late-season rain shower, and the morning was cloudy and cool before the afternoon opened up into beautiful sunshine. 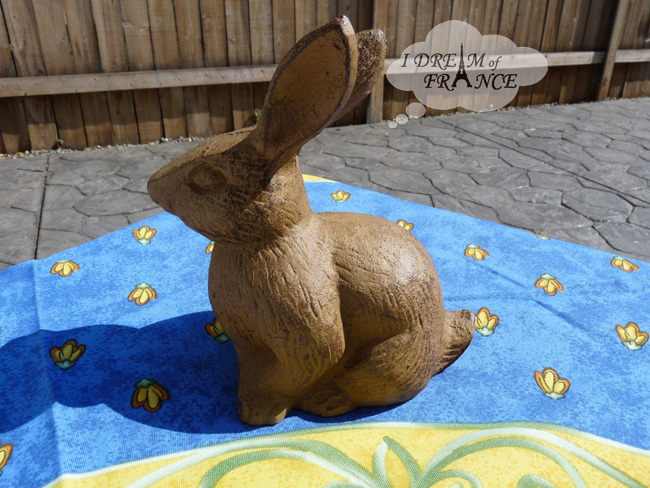 Here are some photos, followed by links to the products I used from I Dream of France. Also shown: handpainted ceramic candlesticks, vintage-style crown decorations, and Le Cluny bread baskets in Lavender Blue and Fayence Red-Cream fabrics. On the day of the Parenting OC Kids Expo, Jean-Michel staffed the boutique and I attended the Expo! It was terrific fun. I met the model who walked our ensemble down the runway (and her mother as well, who gave me permission to snap this photo). Look how adorable she is in the sunshine! I also browsed the exhibitor booths, visited with Ana Brandt Photography, had ice cream from Johnny Rockets, admired the District’s pretty fountains, and enjoyed a SoCal summer day. This Saturday, August 7, Parenting OC Magazine is hosting The Parenting and Kids Expo at The District in Tustin, where you can watch a back-to-school fashion show featuring an ensemble from I Dream of France! The magazine did a preview photo shoot with Ana Brandt Photography (an Old Town Tustin neighbor of ours). See the white dress in the center? That’s our Alphabet Silver and White Dress! We offer it in sizes 2 through 5, and a matching white cardigan with crocheted roses is available. (Both dress and cardigan are made in France of fine cotton.) You can see both pieces go down the runway together at the Expo fashion show. We’re told the model LOVES her outfit! Our Tustin boutique will be closed until this weekend, as we are going to the home decor trade show in Atlanta! Many French companies will be showing their products in Atlanta, so we will find new and wonderful things for you. You can still place orders online if you need something right away. Otherwise, see you back in the boutique on Samedi (Saturday)!